As with many of my generation, two cartoons virtually defined the high-adventure genre of techno-fantasy during my formative years. 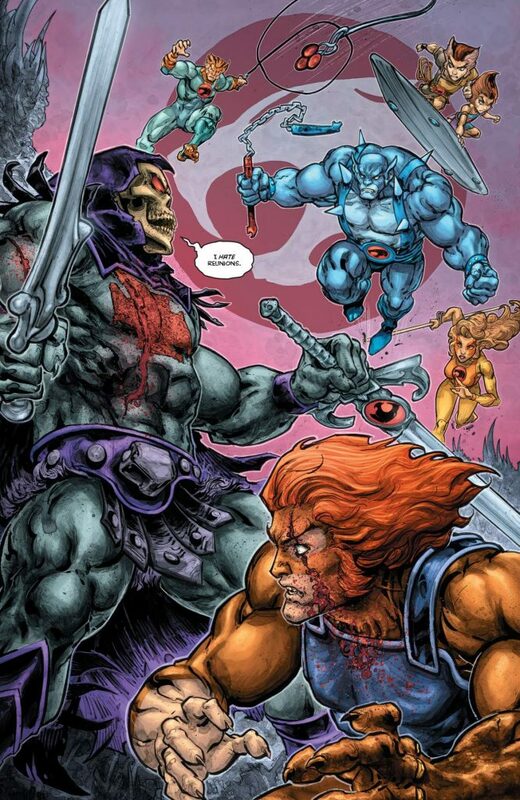 Both ThunderCats and He-Man and the Masters of the Universe featured pseudo-technological heroes engaged in a never-ending battle against the quasi-mystical forces of evil. Both cartoons made my parents very nervous with their parade of occultish imagery and the regular invocation of otherworldly forces. They were very concerned that these shows would cause me to join a cult; I was very concerned that they wouldn’t allow me to watch them anymore. Somehow we all made it through the 80s alive and cult-free. I originally hesitated when I saw the first issue of He-Man/ThunderCats on the comic shop shelves. DC Comics had already burned me on Scooby Apocalypse and the language in Wacky Raceland was starting to grate on my nerves. I wasn’t ready to accept another “re-imagining” of fondly remembered characters that simply cast them as dysfunctional narcissists whose cursing abused my ears. I flipped through the first couple of pages with trepidation and quickly added the title to my pull-and-hold file. Within the pages of that first issue, the character models I remembered from years past burst from the page in Freddie Williams dirty, gritty pencils and Jeremy Colwell’s layered colors. I knew these characters. The lines of dialog could have been drawn directly from the cartoons. The action of the first issue ramped up to a showdown between He-Man and Mumm-Ra that followed the same formula as the cartoons; bad guys attack, everybody fights, the bad guys enact a crazy scheme, the good guys counter with another crazy scheme, everybody fights until the good guys win. Then you reset and do it all again in the next episode. 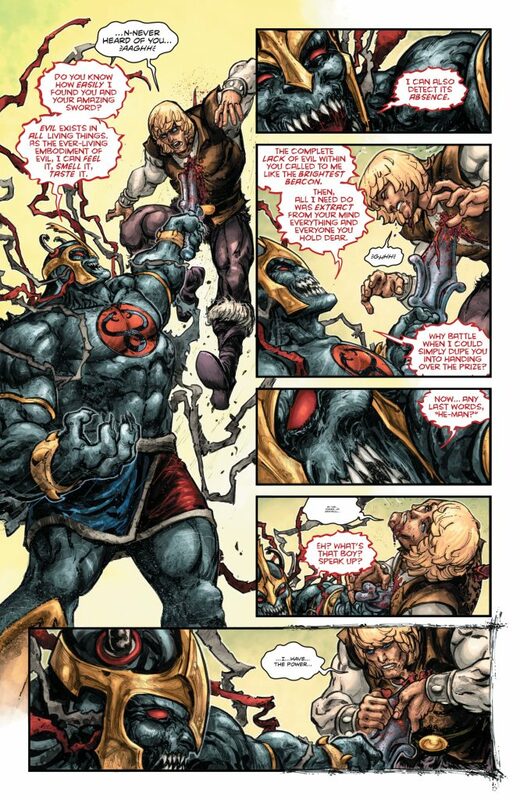 Only this time, midway through issue #1 Mumm-Ra took He-Man’s Sword of Power and gutted him like a fish. I had to read it twice to be sure. In the span of a few panels, a book I had expected to be a nostalgia-filled romp from 30 years ago took a turn that would never have happened on Saturday morning television. Unlike the travesty of Scooby Apocalypse or the vulgarity of Wacky Raceland I found this bit of unexpected violence strangely satisfying. Even kids know that swords are for killing people, or slaying monsters if you prefer. None of the characters in these shows ever got hurt for real, not in any way that wasn’t completely recovered by the start of the next episode. The show titles proclaimed that the fate of the universe was on the line every weekday at 3:30, but even as a kid it felt much more like a game than a battle of good versus evil. And isn’t that what we really want from an adventure that pits the defenders of justice against the villainy of unrepentant evil? We want to see the bad guys do things that are selfish and despicable with consequences that play out in the lives of people affected by their actions. We want to see heroes pay a real and visceral cost in the cause of standing in the gap between the oppressor and the helpless. There is a place for heroes that triumph through cleverness and overcome adversity through skill, but it’s the element of sacrifice that sets apart those heroes who bear the whips and scorns of the oppressor’s wrong and by enduring end them, suffering the injury of evil intent and scorning the dread of that death whose undiscovered country will timely bear us all away. Hamlet’s tragedy is that he must oppose the ills of outrageous fortune in order to make his Quietus; the triumph of Christ is that He endured the full consequence of evil in the place of others and it was insufficient to remove His own righteousness. To intercept evil and prevent its impact only satisfies our sense of balance and fair play; to recompense the consequence of the last full measure of evil’s capability satisfies justice. So if the cartoons of yesteryear failed to take themselves seriously enough, it certainly appeared as if the comic book crossover of today was taking itself seriously indeed. From now on, the bad guys play for keeps. Over the next six issues, everything I ever wanted to see them do in the old cartoon played itself out in front of me. Authors Rob David and Lloyd Goldfine stripped away every trope forced on the cartoons by the grassroots organization Action for Children’s Television. David and Goldfine eschewed the use of vulgarity, narcissism, and depravity in favor of methodical story construction and characters who understood the consequences of their actions and behaved with maturity. Williams’ art depicted ugly, brutal violence with visceral impact that needed no gratuitous gore. Throughout the book the old 80s character models and outlandish schemes reminded me that this particular battle of good versus evil filtered mature, epic fantasy through a lens of childhood nostalgia. I’m not typically much for nostalgia. The popular show Stranger Things did very little for me that way. I do like seeing those old artifacts and elements, but in their original context. I generally prefer modern renditions that reflect the original inspiration and intent, but that are reflective of modern sensibilities. It’s no surprise then that I prefer the character models from What’s New, Scooby-Doo? over the 60s designs, the 2002 Masters of the Universe, and the 2011 ThunderCats. Right from the start, this crossover seemed to me like a step backwards. Getting me to buy every issue was going to take more than rose-colored memories of broadcast television. The art was already doing much to set this telling apart from the source material. The character models still matched the original Mattel toys but Williams’ pencils exaggerated the field of depth and range of motion with heavy emphasis on the line work and regular explosions of krackle dots sized to resemble blowing grit or blood spatter. Colwell’s colors rendered the pastel candy palette of the cartoon in digital watercolor, layering shades to add additional depth and motion to the line art and muting the vibrancy of the characters. The resulting panels provided the book with the kind of visual complexity the cartoon lacked without dumping the old models. The pencils and inks may have been dirty, but the action was clean and dynamic with a clear progressive flow and good communication. It would have been easy for David and Goldfine to simply serve up page after page of fan service, scheming nastiness from Skeletor and Mumm-Ra, goofy banter with Snarf and Orko, or Lion-O vs He-Man to the death. They gave me every bit of that. I didn’t feel like any of the main characters were mistreated and with only six issues I was perfectly satisfied that only Adam and Lion-O received proper character arcs. The story itself is little more than a vehicle for the fan service crossover situations, and even the primary character arcs are extremely simplistic. It really is very much the same as the old television shows. David and Goldfine could have left it at that without doing any harm to the franchise, instead they added a narrator to the action, a voice describing the action as it progressed and reflecting on the events. Every issue received its own narrator with the owner of the voice revealed only at the end. Issue #1 pondered the pompous foolishness of those who toyed with power. 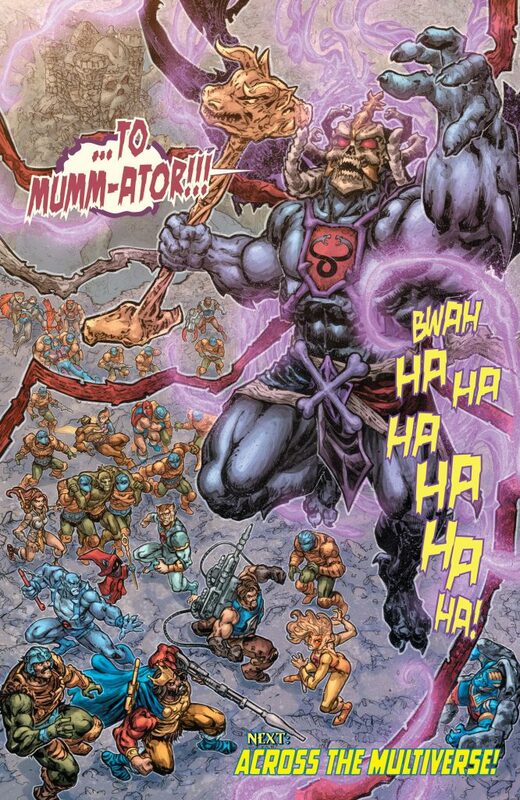 The voice reviled Mumm-Ra for trading with the Ancient Spirits of Evil and called the Masters of Eternia fools for allowing evil to act when it could be prevented. The voice reflected on the absolute necessity for proactive heroes, lest evil beings remake the world in their own image as he, Skeletor, planned. Further issues saw characters despair over the struggle against evil, resolve to stand in the gap, and determine that evil was the only constant in the universe. It added weight and meaning to the spectacle of the crossover, reminding us that it is not life but the play that is a shadow that struts and frets its hour upon the stage, a tale full of sound and fury that signifies something. David and Goldfine never really discuss what that something is that gives life its significance but they do assure us of two things: that evil can never be destroyed, and that heroes will always engage in the battle never-ending. 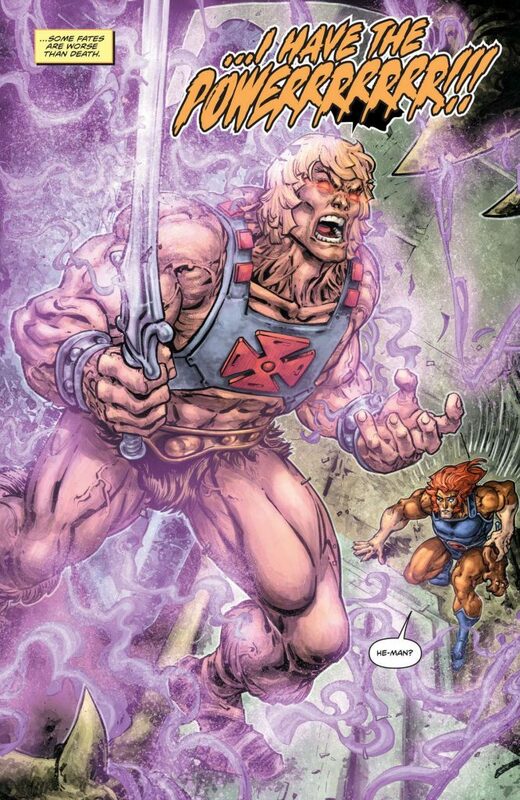 He-Man/ThunderCats is a book worth reading if you’ve got fond memories of the characters or just want a taste of the best of 80s gonzo techno-fantasy. It’s worth considering the implications of the setting and the musings of the narrators. I enjoyed it quite a bit and even though there’s a bit of needless cussin’ from some of the characters I’m very glad to have added this story to my library. I give He-Man/ThunderCats a Quality score “Extremely Gratifying” and a Relevance score of “Suitable for Discussion”. I don’t remember exactly how I stumbled onto Humble Bundle; it probably came up in one of the forums or newsgroups I read. However it happened, I arrived just in time to purchase their Dungeons & Dragons digital comic book bundle. 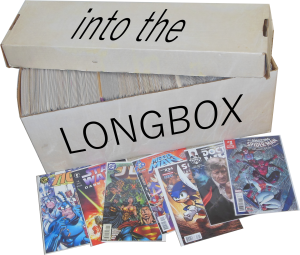 The bundle included the complete runs of the Advanced Dungeons & Dragons and Forgotten Realms books that DC Comics published in the 80s and 90s. It hadn’t really been on my radar at the time; I was mostly into superhero books. At the moment, though, I was craving good fantasy adventure and wanted something to go along with our current D&D campaign. Good value, good cause, great buy. Better than I knew; the bundle also included the more recent books published by IDW. When I flipped open the first pages of Legends of Baldur’s Gate I discovered hidden treasure. It was there that I met a desperate elven sorcerer named Delina, on the run from the minions of the Cult of the Dragon and unable to wield her wild magic effectively. Her flight leads her to Baldur’s Gate and the statue of Minsc, the Beloved Ranger who generations before was one of the original heroes of Baldur’s Gate. Delina’s wild magic brings him to life and the fight is on! Minsc’s first words struck a chord deep within me, ringing a note I hadn’t realized I’d been desperately missing. “Stand down, dirty minions of evil, or face my hamster’s wrath!” Here stood a hero. I’d pretty much given up on comic books entirely five or six years before. The current generation of creators simply wasn’t telling stories I wanted to read. My present comics consumption consisted of a scant handful of web comics that I read whenever I remembered to catch up. Suddenly I remembered how much I loved this art form and how much I missed it. I have more than two decade’s worth of back issues in a wide variety of titles, but there is joy in the discovery of new material entirely separate from the nostalgia of rereading favorite stories. I now had a new hero. The more I read, the more familiar he seemed until a soft light finally dawned. It was as if Ben Edlund had come to his senses and fled the insanity of Hollywood to return to his roots. 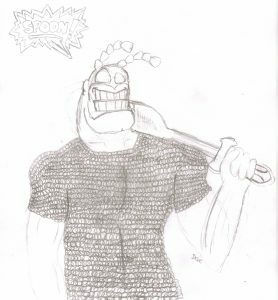 If The Tick wore chain mail and fought evil with a broadsword, this is what it would look like. 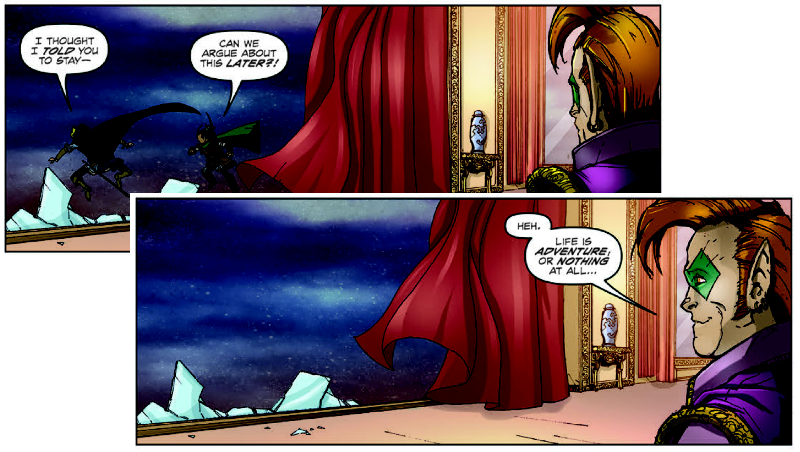 The rest of the book remained rooted in the serious pseudo-realism of dramatic fantasy, without the trappings of the absurd that made The Tick’s entire world surreal. 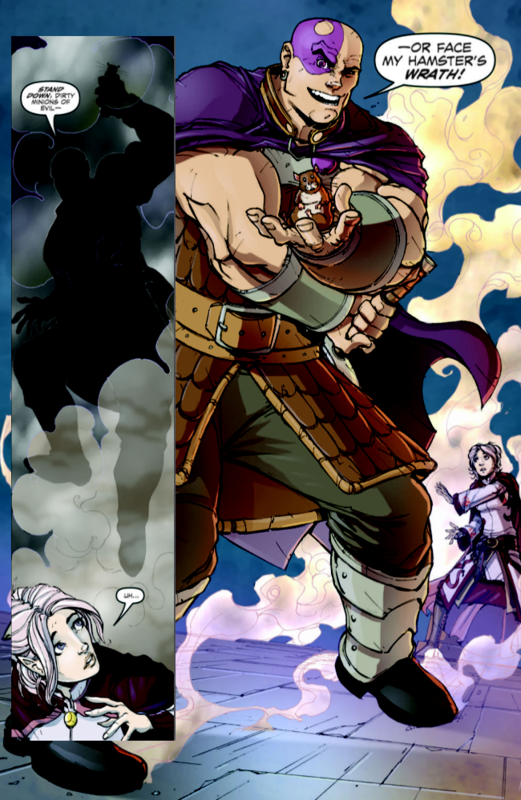 Minsc, however, perfectly echoed that hero’s oblivious optimism and charisma. He was that one guy at the gaming table, the one who just shows up to have fun and smite evil while the rest of the party deals with their intrigues and personal drama. I flipped to the credits page, fully expecting to see Edlund’s name as the headline. Jim Zub? Never heard of him. 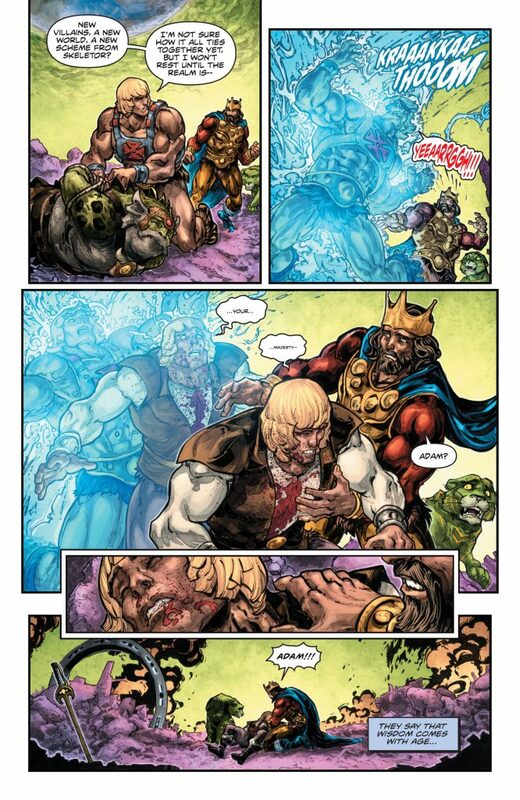 Let’s see … Skullkickers – heard of that but never read it. 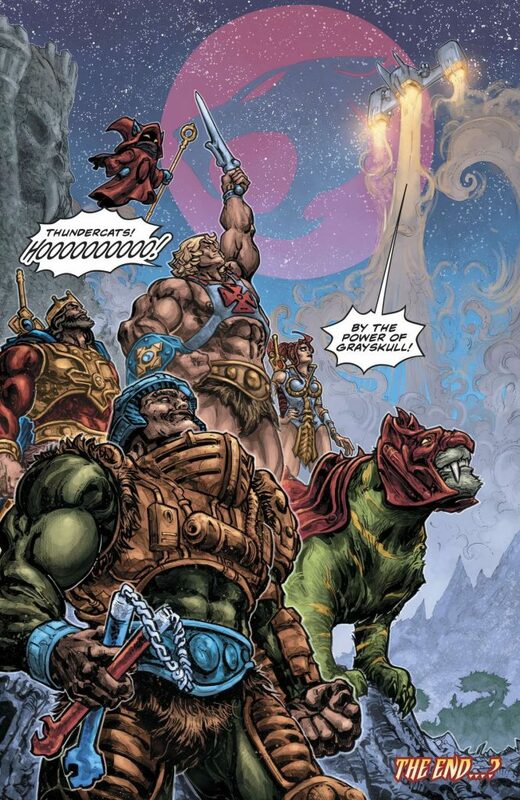 Pathfinder comics – saw them in the store but never bothered. Samurai Jack – how on Earth did I miss a Samurai Jack comic? Figment – my daughter loves that book. This could be pretty good, I figured, but I’ll save my verdict for the end of the book. I loved it. I loved reading comics again. The bitterness and frustration of the past few years washed away with the discovery of new heroes, irredeemable evil, and a sense of adventure with momentum like a freight train. I was very excited when IDW announced a new Dungeons & Dragons series that would follow up with the characters of the Baldur’s Gate story. This new book would also be penned by Zub and feature vampire Count Strahd von Zarovich as the principle antagonist. Excellent. With some temerity, I began to investigate other comics. I quickly shied away from the Marvel and DC superheroes when a glance at the shelves revealed the continuing presence of the same elements that had previously driven me away. I landed at Titan and picked up a new line of Doctor Who books. I drifted past DC and noticed they were going to try and reinvigorate the Hannah-Barbera properties. Archie Comics called to me with the presence of Mark Waid’s name on the cover of a re-imagining of the Riverdale gang and a trade paperback showcasing Mega Man squaring off against Sonic the Hedgehog. Once again, I could read and enjoy comic books. But I had to finish reading my stock of Dungeons & Dragons books first. They were all pretty good. Alex Irvine and Peter Bergting took me to the world of Dark Sun and the quest of a slave for survival and freedom. Paul Crilley reminded me that comics told mystery stories as well, on the world of Eberron. John Rogers and Andrea DiVito introduced me to Fell’s Five in the Forgotten Realms, a party of adventurers drawn directly from my gaming table but who didn’t shy away from the consequences of their actions or the implications of their powers. 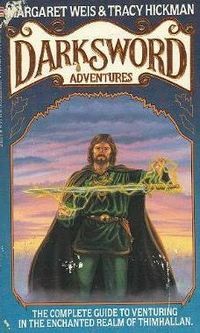 And of course no one does the Forgotten Realms quite like R.A. Salvatore and Drizzt Do’Urden. And then only Jim Zub and Legends of Baldur’s Gate remained. 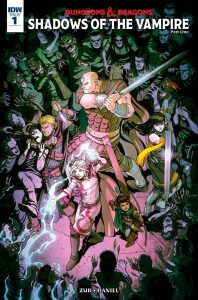 While Minsc and Boo tackled the forces of evil with tireless good cheer and inevitable purpose, the rest of the party rebelled against their parents, quested to save their family, or hung around simply because they had nowhere else to go. The stakes of the story rose to a firey crescendo that swelled and crashed in a wave of action and tide of ebbing emotion. The pacing kept me turning pages, torn between astonishment at each panel and a desperate need to see what happened next. The characters involved me in their personal motivations and desires without dragging me into a morass of juvenile emotional obsession or pedantic explanations of the obvious. The party’s adventures continued in the next volume with Shadows of the Vampire. The corruption of the realm of Ravenloft touched the heroes, laying bare their weakness and beating them down against the power of Strahd and his ability to destroy hope. Through it all, Zub continually threw the actions of hero and villain into sharp contrast, filling the world with people who are selfish, desperate, and compassionate. 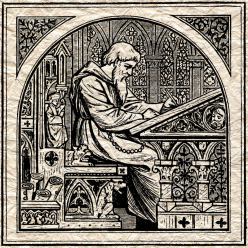 The stories haven’t delved deep into the philosophical discussions of the fantasy realm. They haven’t explored the implications of a world populated by deific monsters and mortals who can challenge the gods. But they haven’t needed to; Zub’s stories possess humanity. These are the people we hope we would be if we found ourselves in their world. 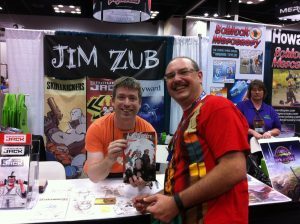 I met Zub at the 2016 GenCon quite by chance. He was working a booth (for his publisher, I presume) and I saw the display of Skullkickers and D&D trades. I commented to my wife that it would be very cool if I could get a signed copy of Legend of Baldur’s Gate. From the other side of the display, I heard a voice pipe up, “I can do that.” We spoke for a bit; he was very gracious and patient with me (no small feat). He’s clearly a fellow comics and fantasy fan blessed enough to be living his dream job. He convinced me to give Skullkickers a try, and signed that book for me as well. Zub continues to write for the industry, picking up more work for Marvel as the writer on Thunderbolts and Avengers, for UDON Entertainment’s Street Fighter license, and for Image in the pages of Wayward and Glitterbomb. 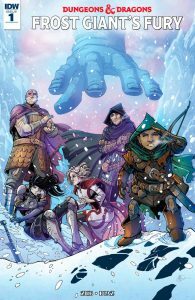 The adventures of Minsc and Delina continue in the pages of Dungeons & Dragons: Frost Giant’s Fury from IDW. I’ve picked up his entire run of Pathfinder comics; Skullkickers is next on my short list. 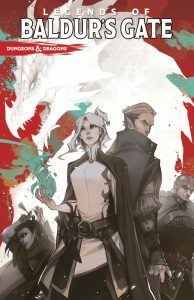 I give Jim Zub’s Dungeons & Dragons books a Quality score of “Excellent” and a Relevance score of “High”. In this episode of Rock the Dragon, we touch on themes of courage and sacrifice as each of the Z fighters lays down his life in an effort to prevent the Saiyans from destroying the Earth. There’s some heavy stuff going on and in the finest tradition of Shakespeare, everybody dies.